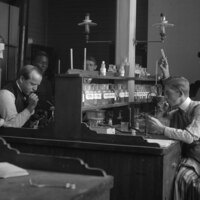 Glass, Silver, and Memory: Images of community by Edward H. Stone is a Colgate Special Collections & University Archives exhibit which features images of Colgate University and of the town of Hamilton, circa 1890s-1920s. Edward Stone was the official campus photographer for nearly fifty years, as well as a prolific local commercial photographer. Digitized from the university archives’ treasured collection of glass plate negatives, the images in this exhibit depict a burgeoning university and its hometown at the turn of the 20th century: the first flimsy electric streetlights in the village; an active Hamilton railyard; construction of the iconic Memorial Chapel; and solemn-faced Colgate seminary students in the classroom. Explore the people, places, and moments captured — in strikingly fine detail — by a dedicated working artist as he documented our community many years ago. Curated by Emily Jeffres, Digital History Project Manager, and Alli Grim, Conservation Technician, both of Colgate University Libraries.